Half of IdeaLab’s STARTER Advanced programme is already over! So what have we accomplished during the previous months? At first we held a pitching competition for teams who wanted to enter the programme. Lucky for us all the teams were really good and had a great business idea. So all teams were accepted to our programme! On 28th of September Fred Kreiger led a workshop about business development. He held the discussion on principles of lean methodology: structured process of testing business model. Lean’s main idea is that organization understands customer value and focuses its key processes to continuously increase it. „Main thing Fred Krieger said is that you need to have a contact with your customer – you need to get their feedback. And this means a lot of talking with your (potential) customer,“said Rihard from sParking. During the following week teams went outside to gather customer feedback to validate their hypothesis. Product Development workshop with Yrjö Ojasaar emphasized again that there is nothing more important than understanding customer experience. Otherwise you might create a product and then start looking for a place to fit it. Long story short „Prototype your customer!”, said Yrjö. Sometimes the good thoughts can come from other teams and this workshop provided plenty of opportunities to share, listen and give feedback. In addition to STARTER teams we had guests from Latvia, teams who are members of EstLat-Accelerate programme. Mentor Feedback Session could be called the highlight of the programme since it brings together entrepreneurs from different fields who are willing to provide mentorship and guidance. Altogether 17 teams pitched and got 10 minutes of feedback from the mentors. Out of all the teams Harri Tallinn (Ajujaht organizer) selected one that will automatically get to Ajujaht TOP 100. The lucky team was Decomer Technology with Mart Salumäe and Kelly Kangur! They are producing biodegradable gelatine-based polymer material. In simple words in near future you can add honey to your tea in a package that melts into the hot water and it’s 100% healthy! Friendly mentor panel was really inspired by young team Juice3 (cube) pitcher Hugo Palm who got a special award for the most motivational pitch of the day! They are working on putting juice into cubes so you don’t have to carry a pack of juice with you – the future is here! Hugo says that through the workshops they have received tips to use in real life and this helps their team to understand business world better! 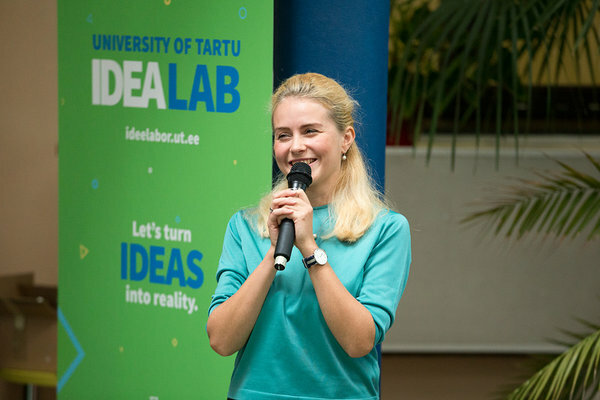 Our first time mentors Tanel Tähepõld and Helen Kalberg pointed out that all the ideas were really great because of their potential world changing nature and they are both willing to come back to other workshops as well! Next stop – Grow, Fail or Pivot! Helen Kokk and Tanel Tähepõld will share their stories about failing and getting back on their feet. Find more information from IdeaLab’s homepage. STARTER Advanced is finishing with pitching competition Kaleidoskoop. 10 best teams will have a great opportunity to pitch at sTARTUp Day on 8th of December! STARTER Advanced is funded by European Social Fund.